This week, or actually last two days as I have barely been able to put it down, I have been reading a story by a girl who was raised by an ogress in a house that contained only six books, most of which were about God. The ogress believed that books led to temptation, to danger, to wickedness, to lands where wild things festered and fought. She was right about where books lead, but wrong that this is to be avoided, that the doors must be shut and bolted. We should all visit these lands, from the safety of our bedrooms or sofas, we should test temptation in its glittering, wondrous clothes, we should risk danger, fight wickedness, like the heroines on the pages, with our own internal good. 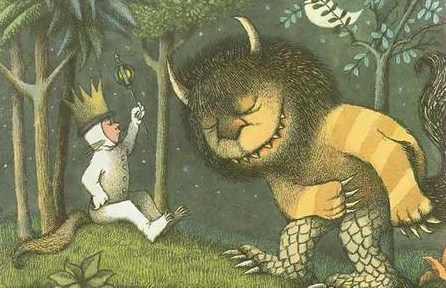 As the girl in the book says, reading is where the wild things are. And it is a place to which I want to travel daily. Oh, and in case you were wondering about the ogress, and whether she was slain, or vanished by magic: well, that only happens in fairytales, and this story, incredibly, was all true. This entry was posted in Blog, Reading, Teen and tagged books, escape, Jeanette Winterson, reading. Bookmark the permalink.